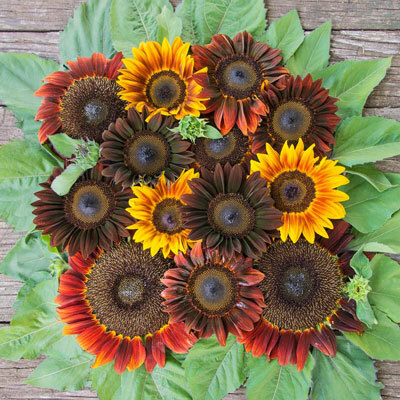 Royal Flush Mix Sunflower | Henry Field's Seed & Nursery Co. Dazzling 4 to 6 in. sunflowers soar on 6-ft. stalks! Dynamic color combinations—orange with red and yellow, rusty reds and yellow—contrast with dark brown centers. Dramatic as cut flowers! Impressive for borders and backgrounds! Happy even in poor soil! 60 DAYS. Spacing: 8 - 18 inches. Color: Combination of red, red & yellow, rusty reds and yellows. Foliage: Medium green pubescent foliage. Blooms: Summer, 60 days to maturity. Flower Form: Dark brown disk.